We are delighted to have published two recent guest posts and wanted to say hello to anyone who may have found us through them. Our post for Travel Dudes was on our brilliant trip to the US and how we loved being Family of the Day at the Magic Kingdom. You can see this article on Travel Dudes. It includes this picture of us with the cast of the opening show – after which I opened the park with the classic words “Good Morning”! If you’ve come to us via Travel Dudes and are interested in reading more about Disney World or Orlando, take a look at Jessica’s post on the best rides at Universal Studios, whether 11 is too old for Disney or my post for BritMums about SeaWorld. 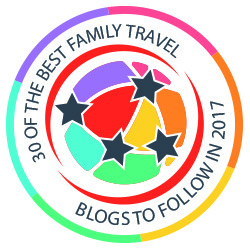 You may also have come to us via Travel Bloggers Unite, where we gave our 5 tips for having fun in London with kids. If you’ve come to us via TBU and are interested in more on London, you could take a look at our posts on the Science Museum, the Shard or the Southbank, and check back here soon for pieces on the fabulous Spy hotel (St Ermin’s hotel) and Buckingham Palace. Please also take a look at other places we’ve been and give us your recommendations.